Gardens and house exteriors including repainting walls and pipes, window fames/woodwork glossing, a complete garden makeover or laying a new patio, decking or lawn. Jobsmiths provide a services for gardens and house exteriors. Whether you require your walls repainting, window fames/woodwork glossing, a complete garden makeover or simply the laying of a new patio or deck area, Jobsmiths are here to help. Accustomed to working in gardens without direct access, Jobsmiths have the utmost respect for your property and take considerable pains to protect it at all times. I live on a hill and my neighbours garden is falling under my fence. How do I stop it? Any slope will pose problems if it's not banked up. We can build a small wall or install a gravel board under your fence. If your garden is sliding downhill, we can install railway sleepers or gabions (boulder filled wire cages). The flagstones in our garden are uneven and hold puddles. Help! 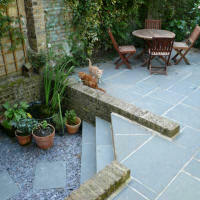 We can lift and relay paving stones, or create a patio area with decking instead. Or we could re-landscape creating a lower and upper level with steps between. Whilst we are in the garden, you might consider asking us to build a barbeque area. My garden small but is getting too much for me, but I don't want to cover it in concrete. What shall I do? Jobsmiths can create a user friendly garden, with raised beds for flowers or vegetables, or lay paving or build decking with planters and hanging baskets for your planting, so apart from watering there's less labour. I have no garden but would like to grow some herbs and flowers and vegetables. You could grow carrots, tomatoes or flowers in hanging baskets or window boxes . Jobsmiths can custom build these for your windows and mend that broken window pane or catch whilst we’re at it! And fit window locks. If you have a balcony or roof terrace we can covert that into a planting and seating area or stock planters. My grass has got bare patches. Can it be fixed? Jobsmiths can lift your the turf and lay a whole new lawn, or just patch up or re-seed the worst parts, or make a feature of the bare area with flower beds or a herb garden, or coloured gravel. We can neaten up the edges and mulch any surrounding beds. Or we can lay a pathway or stepping stones. Can Jobsmiths fix my fence / shed that is falling down. We can fix it or replace it, sourcing fence panels to match new to existing where possible. If it’s warped we can re-place the gate. If the hinges have dropped we can re-hang the gate. I want a garden makeover. 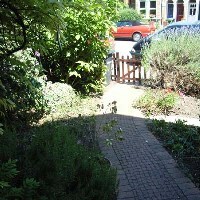 Jobsmiths can do this for you, from garden design and sourcing, to the labouring. We can build a greenhouse for you to cultivate from seed, or we can work with your existing plant stock. We can lay a pathway, or build decking, erect a pagoda or archways or trellis for your climbers, create ponds and install water features. The paint is flaking off my windows. Exterior paintwork needs to be re-painted every 5 years or so in order to protect the woodwork underneath. Jobsmiths can do this for you, either stripping right back if the condition is really bad, or sanding and over painting. We can do your exterior doors too. The pebble dash needs repainting. 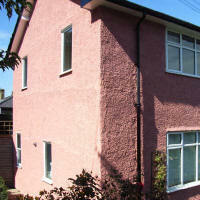 Whether it’s the whole of the house, just one wall, or around your newly fitted windows, we can paint your pebbledash.